December this year will see the Eye of the Hurricane over Copenhagen, not Oslo. While US President Barak Hussein Obama has said he will travel to Norway to pick up his Nobel Peace Prize on December 10, neighboring Denmark will host the biggest and most important Climate Change Conference ever from December 7 to 18. Obama has declared he will NOT go to Copenhagen to take part in these most important talks. Can you imagine that?! As I’ve already pointed out very thoroughly, all the motivations given from the Nobel Committee for awarding Mr Obama the Peace Prize are 100% invalid. While we can argue and discuss whether his presidency thus far has been a peaceful one or not, it CANNOT BE ARGUED that it took place in 2008. And the Statutes for the Prize are very clear: The work that qualifies for the Peace Prize MUST be done by December 31, 2008. It says so in the very first paragraph – §1 – and its very first sentence. So there is absolutely no doubt that Alfred Nobel considered this crucial point to be an important one. The good work had to be DONE, it was not to be a wishy-washy vision of something one MIGHT have done if one had the time and resources, somewhere in the future. So dear Mr Obama, you do not deserve this prize. Not at all. Not because your presidency is not a peaceful one – that remains to be seen – but simply because it did not take place in 2008 or any past years that could qualify for such a golden prize. And even though you may end up going to Oslo anyhow, not to upset those Norwegians who gave you this honor, you should at least make a day-trip down south to Copenhagen, to show the world that you actually care enough about the Climate Crises and Our Common Future on this planet to actually be present. If only for a snappy photo op with leaders from the rest of the world. This Blog takes part in the Blog Action Day 2009. My emphasis is on the words «during the preceding year», which in this case was the year 2008. 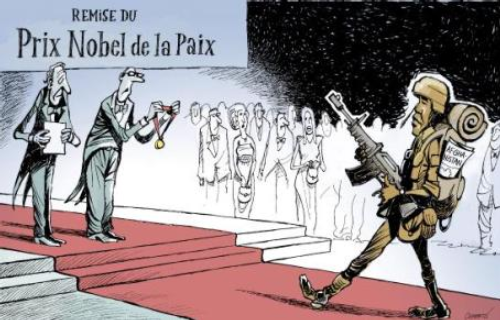 All the five Nobel Prizes for 2009 are correctly awarded for work done in 2008 – except, it seems, for the Peace Prize, as we shall see. Firstly, the announcement from the Norwegian Nobel Committee talks about «Obama as President» and lists what the Nominee has done for the cause of peace «as President». However, the Nominee only became US President on January 20, 2009, so these motivations are in fact not valid. Secondly, the announcement from the Norwegian Nobel Committee talks about the Nominee’s vision of a world free from nuclear arms. But again, this motivation is in fact not valid, as the Nominee’s vision was announced as late as September 24, 2009, just days before the announcement from the Norwegian Nobel Committee. And thirdly, the Nominee’s appeal that «Now is the time for all of us to take our share of responsibility for a global response to global challenges» also fails to qualify as a motivation for the Nobel Peace Prize, as these words were first uttered by the Nominee at the United Nations on September 23, 2009. Conclusion: As the motivations of the Norwegian Nobel Committee for awarding the 2009 Nobel Peace Prize to the Nominee – as stated in its announcement of October 9, 2009 – are all invalid as per the very first sentence of the very first paragraph in the Statutes for the Nobel Foundation, I hereby urge you to annul the October 9 announcement from the Norwegian Nobel Committee and award the Peace Prize for 2009 to someone who in 2008 actually has done a great job for peace, and who actually has conferred the greatest benefit to mankind.